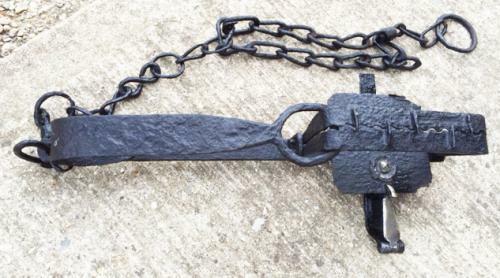 Large Badger Trap by John Williams & Son, Wednesfield England, second part of the 1800s. 8 and a half inch toothed jaws. Complete with original chain intact. Spring strong and working, maker's marks under brass catch. Overall condition good for it's age. Note now illegal to use.